Comments/Context: Flattened views of city buildings have long been a favorite subject for urban photographers, from Harry Callahan, Aaron Siskind, and Ray Metzker in Chicago, to Nicholas Nixon in Boston, and extending to every camera toting visitor ever to pace the sidewalks of skyscraper-dense canyons around the world. Interlocked, overlapped patterns captivate us, especially when they soar with such immensity of scale. While Barbara Crane’s architectural abstractions may not be as well known as many, her 1970s photographs of the Chicago Loop exhibit a mastery of form and craftsmanship that certainly makes them worthy companions for the very best this genre of photography has to offer. It all begins with cropping out the sky and turning the resulting amalgamation of buildings into a dense patchwork of textures. 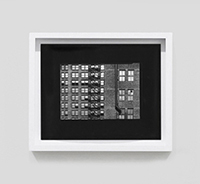 In many ways, Crane’s images are like an iterative set of strict compositional exercises, centered on edges. Fragments of masonry and windows are alternately set into full frames, equal opposing halves, four quadrants, and contrasting rhythmic stripes, always squared off and aligned. The joy in these pictures is to be found in watching how Crane plays with the density of patterns, the angles and planes of space, and the spectrum of tonalities. Verticals shoot upward, fire escapes and scaffolding triangulate to the sides, and windows march in strict horizontals. Old and new are thrown together with meticulous precision. Sleek and rough fight for superiority. And dark and light (and especially shadow) tussle and grapple. By allowing the surrounding border turn to black (with the edges of the negative holder clearly visible), Crane not only creates a thick tunnel of contrasting darkness, she also reminds us of her use of contact printing and its resulting sharpness. These are city abstractions that were meant to be crisp and tight, and they have been executed with expert accuracy. Seen together, the series captures the vibrancy of Chicago’s architectural melting pot, while providing Crane with a seemingly endless stream of formal geometric variations to explore. These controlled abstractions simmer with fresh energy, feeling bright, vigorous, and sharply etched even forty years later. Collector’s POV: The prints in this show are priced between $4000 and $7000 each. Crane’s work has little consistent secondary market history, so gallery retail remains the best option for those collectors interested in following up.